Hello and welcome to the Vision-Riders, a site dedicated to the Victory Vision and it's soon to be owners and enthusiasts. My name is Lloyd Greer and I will be writing an article or two from time to time primary revolving around the technical aspect of the Vision. 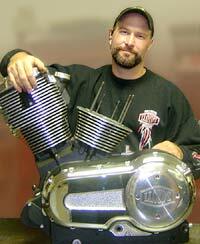 I am the owner of Lloyd'z Motor Workz, an independent and fast growing Victory performance shop based in Pine Bush NY. We have a tremendous amount of knowledge with Victory motorcycles and welcome the addition of such a fine piece of workmanship like the Vision. In my first writing, I'd like to touch on the introduction of the Vision and Victory's commitment to its customers, and the reaction it has received from the masses. I travel a lot to the large rallies and in the process talk to a large number of people who've seen the Vision. Its introduction to the public brings forth good, bad, and indifferent reactions. While not a large touring fan myself, I look at this bike as more then just its appearance. I can see underneath the bodywork and have a true admiration for it, its employees, and build teams. They are going, and have gone, where no other company has ever gone before in such a short time. Now, like it or not this bike has flare and character, and the company that builds it deserves praise. Victory committed a large sum of money, demographic research, and R&D, then invested it into a machine for which they thought the people would love. They took a quantum leap (and big gamble) to expand their product line with such an advanced bike for you the consumer. Years were spent on the Vision with countless hours of research & development before the public ever saw it. So what makes it different than any other company? Them doing just that! There are other companies that don't change design, or push the evolution of bike technology. Victory needs credit for coming through with such a work of art. Like it or not, credit they deserve. Lloyd is the owner of Lloydz Motorworkz (http://www.lloydz.com) and is regarded as one of the most experienced Victory performance engine builders & tuners in the country. Lloyd shares his technical expertise and views with Vision-Riders. Victory has an App For That!